Instead of using an RSS reader, you can show items from an RSS feed on an Excel worksheet. Get the free workbook with an example. Two methods are shown -- add an XML Map, or import the feed. Instead of using an RSS reader, you can show items from an RSS feed on an Excel worksheet. See the steps in this video tutorial. The written instructions are below the video. The first step is to find the link for the RSS feed that you want to show on the worksheet. In this example, we'll use the RSS feed for the Contextures blog. Go to the Contextures blog, and look for an RSS icon, in the sidebar at the right. Next, you'll use that RSS link to create an XML map in a workbook. On the Ribbon's Developer tab, in the XML group, click Source. 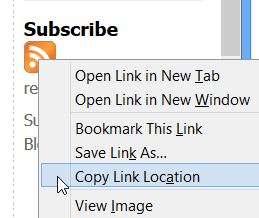 Click in the File Name box, and press Ctrl + V, to paste the copied RSS link. Click Open, and then click OK, if a message appears. 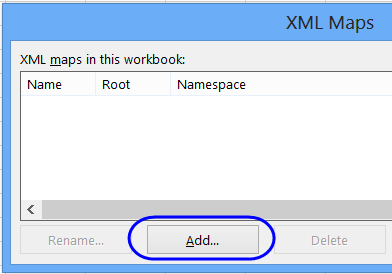 Click OK, to close the XML Map dialog box. In the XML Source task pane, find the Item section, and click on the Item heading, to select it. Drag the Item section heading to cell B3 on the worksheet. This creates a table on the worksheet, with the headings from the Item section. 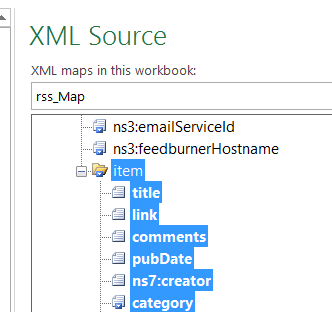 If you have a problem with creating a new XML map (method 1), you can follow the steps below, to import the RSS feed. Next, you'll import that RSS link in an Excel workbook. On the Ribbon's Developer tab, in the XML group, click Import. In the window that opens, click in the File Name box, and press Ctrl + V, to paste the copied RSS link. Click Open, and the Import Data window will open. Select a location for the data, and click OK, to close the Import Data window. 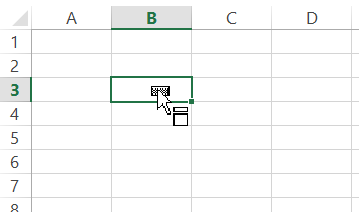 On the Excel Ribbon, click the Home tab, then click the Wrap Text command twice, to turn off the Wrap Text setting. 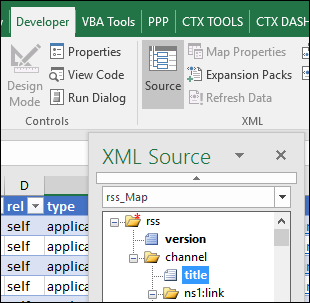 To see the XML Map that was automatically created, go back to the Developer tab, and click the Source button in the XML group. 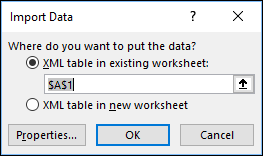 The XML Source will appear in a pane on the Excel worksheet. Click on an XML Source item that has bold text, and that item will be highlighted in the worksheet table. To see the RSS feeds for the Contextures Blog and the Contextures website, please download the sample file: Excel RSS Feeds Sample File. This was created with Method 1 -- Add XML Map.